Corruption is a disease that has control of all aspects of the Philippines. No matter how you look at nearly everyone in control of the country they all appeared to be tarnished with corruption and court cases and even prison does not stop people voting for them again and again. The office of the President, or more over Vice President is big news in the Philippines at the moment. The Vice President is looking under huge pressure for trying to hide millions upon millions of pesos. But, the newspapers have the news and they are out for blood. AMLC is Anti-Money Laundering Council, which reportedly submitted a report to the Court of Appeals indicating that the bank deposits under the Vice President’s name, alleged dummies and his son, Makati Mayor Jun-Jun Binay, have reached P11 billion since 2008. Citing the errors in the AMLC report, the Vice President said that his assets did not only come from his salary as a government official but also from his businesses. “Sinasabi ng AMLC na ang source of funds ko ay ang sweldo ko lang kaya hindi tugma sa amounts ng mga bank accounts ko. Hindi totoo ‘yan,” he said. “Kasama sa accounts ko ang mga kinita at naipon ko bago pa ako sumama sa gobyerno. Mayroon din kaming negosyo na ilang dekada na. Nagbabayad din kami ng buwis. Pati ang legal campaign contributions na naka-report sa Comelec sabi ng AMLC ay tagong yaman. Mali talaga ang AMLC,” he added. Binay said the AMLC report was wrong because it also included accounts that were already closed. “’Yong mga 237 accounts at transactions ng ibang tao, pinalalabas nila na sa akin. ‘Yan po ay hindi totoo at gawa-gawa lang. Mali talaga ang AMLC,” he said. The Vice President said the release of the AMLC report was part of a “conspiracy” to destroy him and derail his presidential bid in 2016. 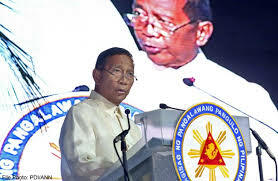 Ombudsman investigators have found sufficient evidence to proceed with the office’s probe against Vice President Jejomar Binay, his son Makati Mayor Junjun Binay, and 22 others for alleged involvement in an anomalous parking building project in Makati City. The special panel of investigators filed yesterday a complaint before the anti-graft agency’s preliminary investigation bureau for graft, malversation of public funds and violation of the procurement law. Probers said the charges stemmed from several alleged irregularities in the procurement and award of the contracts for the design and/or architectural services and the construction of the Makati City Hall Parking Building.